The Land Mark is an item from BuildCraft 3 used to mark out an area, usually as an indicator of the area for a Quarry, Filler, or Builder to work. 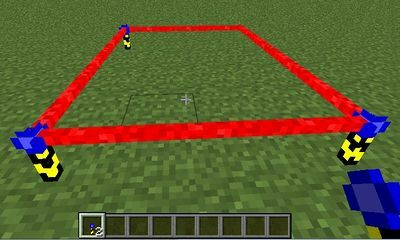 By placing down two or more Land Marks along the same axis and then right clicking on one of them, a red line will appear connecting them. This line is purely graphical and will penetrate through any blocks in its path. Placing a machine next to correctly activated Land Marks will cause all Land Marks to fall to the ground. Placing three Land Makrs and right-clicking them, will auto complete the rectangle. See below. Additionally, you can power a Land Mark with a Redstone signal to see blue guidelines of 63 blocks in length extending along the three Cartesian axes. Land Marks are activated by right-clicking a Land Mark when a second Land Mark meets certain criteria. Activated Land Marks are used to define rectangles and cuboids for the Quarry, Filler, and Builder to operate in. A rectangle can be created (e.g. for a Quarry) by defining three of the four corners of the rectangle in the same plane. The Land Marks will complete the rectangle when activated by right-clicking each Land Mark. To properly define an area with the Land Marks for a Quarry, the Quarry should be placed adjacent to an activated Land Mark. Otherwise, the Quarry will use its default size. Successful placement of a Quarry will result in the red beams being transformed into black and yellow striped beams, and the previously activated Land Marks will fall to the ground. A box can be created (e.g. for a Filler) by first creating a rectangle and placing a fourth Land Mark in the third axis to draw out another corner of the three dimensional box that will be filled. Right-clicking the "central" landmark will usually show lines outlining the whole box, however this doesn't always render correctly. When the filler is correctly placed adjacent to an activated Land Mark, the previously activated Land Marks will fall to the ground, and red and yellow striped beams will appear around the volume. By providing a Redstone signal to a single Land Mark (e.g. a Redstone Torch or Lever next to it), blue guidelines will appear extending along the three Cartesian axes from the Land Mark. These lines will be 63 blocks long and will pass through blocks. This can be used to help line up the next Land Mark or just to help visualize straight lines along an axis. 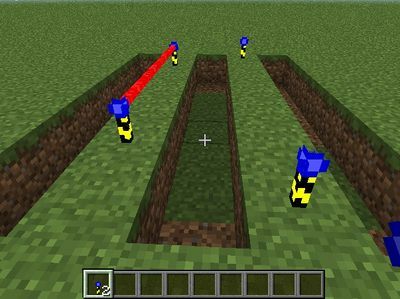 Create assisting lasers by placing a Redstone signal next to a Land Mark. This page was last modified on 24 December 2016, at 09:54.